The past month, I have found myself in the Northridge area nonstop. Between graduating from college, and my friend getting married at of all places, the college, I have been able to frequent the nearby card shop a lot. I have always enjoyed the card shop because I have got a ton of steals on their bid board. Last week I was in there a half hour before the board ended and bid on a good 15 items. I was expecting a major haul when I came in Friday, right before the wedding rehearsal. To my dismay, I ended up with 2 items. I have had better luck when I bid on a Wednesday – note: the board ends Saturday afternoon. So 2 cards and autographs for $2.25. Dri Archer for a whole buck, and Hector Olivera for a dollar and a quarter. Boy has Olivera’s autograph fallen off a cliff. The ‘Buy It Now’ price on the autograph was $2 and no one took it. $4.25 total for 3 basketball legends autographs and 3 1969 baseball cards. Leonard ‘Truck’ Robinson, Herb Williams, and Allan Houston are the autographs. At the start of the year, I made a wish list of players whose autographs I wanted. On the post, I was realistic about the chances of getting most cards. I even broke them down into sections like attainable, unattainable, want but can live without, and ‘probably attainable if I put my mind to it and do a thorough search.’ I really haven’t done a good job of targeting anything on that list. I had to stumble upon one by accident for the most part – for the record, I am not counting the Twitter offers I get but turn down because I don’t have money at the right time. I stumbled upon an auction of a target on the latter of topics I just mentioned. I wasn’t expecting to get it. We are in hockey playoff time so this is prime time to move hockey real estate. I was shocked that I got it for $9.50 shipped. Even though I am struggling to find an exact match for sale, or even previously sold elsewhere, it seems like a legit autograph to me. I do want to commend the company for a quality that I like about the card.The whole box with the signature appears to be a sticker. Instead of a clear sticker like most companies do, this appears to have a piece of the photograph in the sticker. 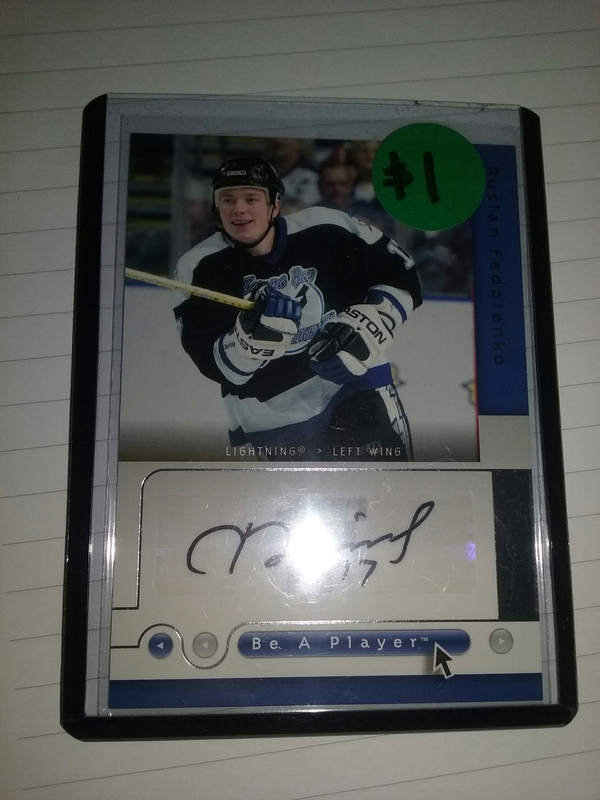 I have never seen that before and it is a nice change from the sticker autographs I am used to. In the whole year plus that I have done this site, I have yet to do a break. I simply avoid breaks. Most are priced way too high for a budget collector like myself. On top of that, my two favorite teams are usually priced at a premium. My teams only have the two best players on the planet in their respective sports in Clayton Kershaw and Cam Newton. With Cam Newton coming off an MVP season, finding a reasonably price break team break with the Panthers is next to impossible. So when I saw a reasonably priced 5 box break from Bad Boy Box Breaks for the Panthers, I thought about it for a few hours then jumped on it. After a package hiccup from them, see post titled “Angry,” I knew karma was on my side. I feel that I did pretty well. Hit an autograph, and a two numbered cards. Kuechly’s card is numbered to 75, while the Cam is numbered to 249. It is pretty easy to do worse in breaks. I should add, I accidentally bought into this break on a day that wasn’t conducive to my schedule. There was no way that I could be home during the time of the break. I was able to catch the break when I came home a few hours later. This might be the first time I posted about a break on here, but it might not be the last if Bad Boy Box Breaks keeps offering reasonably priced breaks.